The project Carbosense establishes a uniquely dense network of approximately 300 CO2 sensors distributed over Switzerland with a dense cluster over the city of Zurich to provide near-real time information on man-made emissions and CO2 uptake by the biosphere. The sensor nodes are equipped with low-cost, battery-powered sensors and partly with more expensive and accurate sensors and use Swisscom's new Low Power Network (LPN) for data transmission. Carbosense is a nano-tera Gateway project funded through the Swiss National Science Foundation (SNSF). It proposes to leverage recent progress in CO2 sensor miniaturization and affordability with newly available Low Power Networks, or the "Internet of Things" in order to better understand and characterize atmospheric CO2 concentrations and carbon fluxes in Switzerland. Despite efforts to assess carbon fluxes to the atmosphere (e.g., the recent project CarboCount CH), a time-resolved high-resolution understanding of CO2 fluxes is still missing to fully characterize the biosphere response to climate change (e.g., sensitivity to drought or heat waves) and to independently control and monitor measures and commitment to reduce anthropogenic CO2 emissions from the use of fossil fuels at different administrative levels, from the city to the national scale. 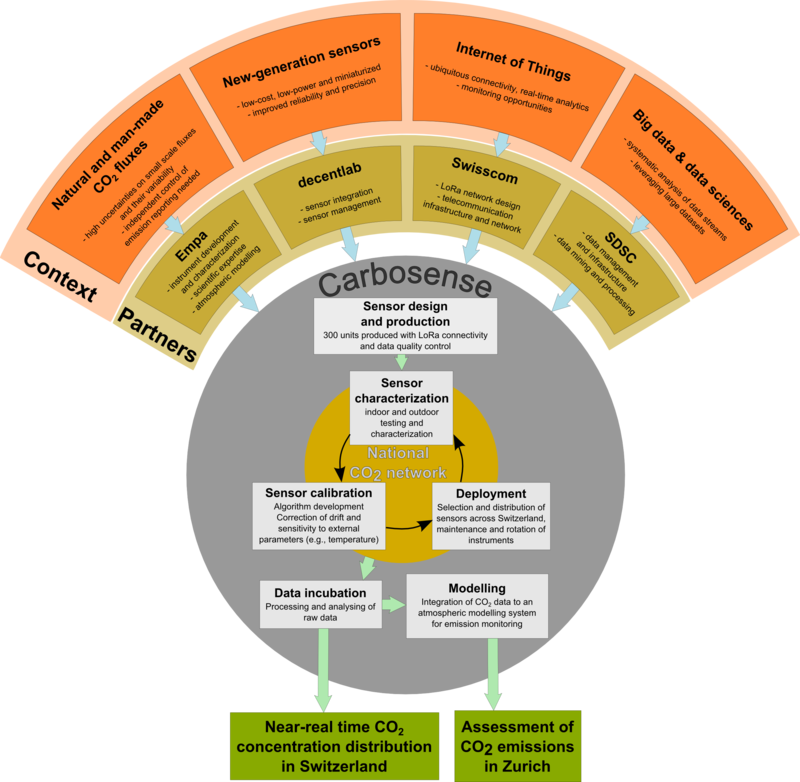 The Carbosense project is fully based on an atmospheric approach to characterize surface CO2 fluxes. The latest influence the distribution and variability of CO2 concentrations. Documenting CO2 concentrations enables retrieving CO2 fluxes through so-called inverse modelling techniques. In the framework of Carbosense, numerous low-cost CO2 sensors are deployed all over Switzerland to monitor CO2 concentrations in near-real time. Collected data are merged with modelling systems to determine CO2 emissions. Low-cost sensors are less accurate than their reference counterparts usually deployed to monitor long-term variability of CO2 concentrations. Thus, careful characterization and calibration of sensors is needed for operating such a unique dense network. The "Internet of Things" is expected to dramatically grow in the next years. The Carbosense project is a unique opportunity to prove the suitability of such a concept for monitoring our environment. The project aims at setting up an operational distributed network providing valuable insight on our CO2 emissions to the atmosphere. The project is led by the Swiss Federal Laboratories for Materials Science and Technology (Empa) and involves partners from the companies Swisscom and decentLab and from the newly established Swiss Data Science Center SDSC. External collaborators also contributes to the deployment of the network.